Guard Dog Security presents the world’s first and only tactical flashlight with built-in concealed inner stun gun technology. The Diablo shines a blinding 160 lumen light to illuminate far and bright, yet also effective for self defense purposes. Ongard - Electric Shock Knife, Stun Gun. Excellent self-defense and combat training tool. 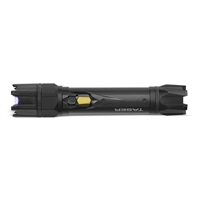 Combine the usefulness of a high-intensity flashlight with the protection of a Taser StrikeLight stun gun.